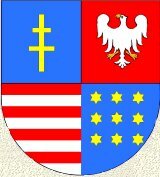 Dolnoslaskie (Niederschlesien or Lower Silesia) Uses the Historical Arms of Silesia. Last edited by Marcus Karlsson on 14 Aug 2017, 09:55, edited 3 times in total. Podlaskie. Lies along the Border to Lithuania and combindes the Eagle of Poland and the Vytis Knight of Lithuania. Pomorskie (Pommerania). These Arms historicaly are those of Kasjubia. This Woiwodeship cowers the Arean surrounding Gdansk which includes the historical Area of Kasjubia. The Pommeranian Arms are Argent a Giffin Gules, which have not been chosen. Lubelskie, the Area surrounding the City of Lublin. Slaskie, uses the traditional Arms of Upper Silesia. Swietokrzyskie, the Area surrounding the City of Kielce. Torunskie. This is an "polonised" version of the Arms of West Prussia. The Black Prussian Eagle replaced by the White Polish Eagle. Historical Arms of West Prussia. Zachodniopomorskie (Western Pommerania). I did mention that the Pommeranian Woiwodeship didn't use the historical Pommeranian Arms, which in stead is used by the Western Pommeranian Woiwodeship.